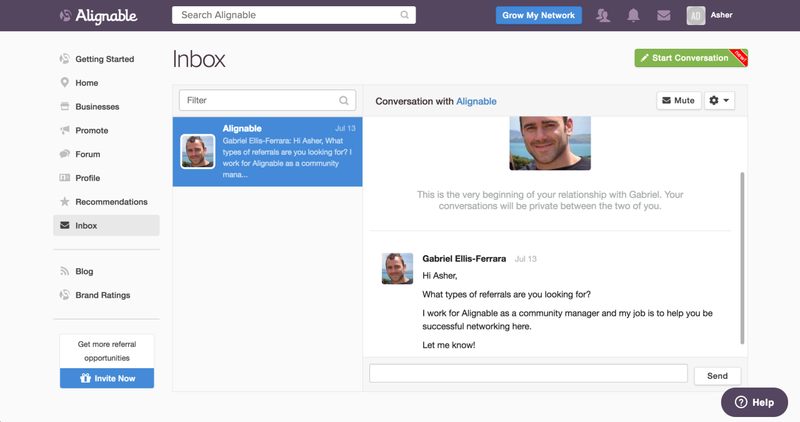 Upon landing, Alignable only asks for your name, email address, password, and company name. We like this because it’s super quick and easy to get started, which reduces churn right off the bat. Too many required fields to fill out becomes a hassle for users, which makes it much more likely that users will bounce right away. Once in the app, the only direction given is a ‘jingling’ bell in the upper corner. We like this because it allows users to explore the page naturally, on their own, rather than being directed with modals or tooltips. Rather than saying, “Here are your notifications” with a tooltip, this CTA encourages user engagement. Modals and tooltips certainly have their place in onboarding, but actionable hotspots serve a unique and important purpose, and seem more appropriate here. The third and final phase of the onboarding process is receiving this welcome message. We like this because it personalizes the experience, while also introducing the ‘Inbox’ feature naturally. Personalizing the onboarding experience can often provide the much needed friendly-touch that motivates users to complete the process.